National Conference President Dr. Farooq Abdullah on Thursday reminded Home Minister Rajnath Singh that the issues in Kashmir cannot be resolved unilaterally by New Delhi and sought engagement with all shades of opinion in the Valley.“Putting Hurriyat leaders under house arrest or under detention will precipitate the already fragile situation rather than solving anything”, Dr Abdullah said while speaking at a joint election meeting of National Conference and Congress in Ganderbal this afternoon, adding that this will not help in resolving Kashmir issue.Dr Farooq Abdullah slammed PDP for unleashing an unprecedented crackdown on separatist leaders at the behest of their masters in New Delhi. He said the separatists were as usual proceeding on their way to Pak Embassy in New Delhi to attend the Pakistan Day celebrations but the action of the government to put them behind bars will further compound the stalemate in Kashmir.The National Conference President cautioned the Centre that they cannot enslave Kashmiris who have never succumbed to pressure. He said the people of Kashmir have always fought for their honour and dignity and would continue to do so despite suppression. He urged the people to stand united and foil all machinations of anti-Kashmir forces.He recounted numerous instances of betrayal perpetrated by the PDP leadership in different avtaars and said that PDP came to power in 2002 by promising those brandishing guns that PDP would be their voice in the Assembly. He said when Late Mufti Mohammed Sayeed became the Chief Minister in 2002, he sent out an open message to militant commanders during public meeting in Ganderbal that their role had ended as the PDP had come to power. “However, soon after taking over the reins of administration, the then Chief Minister unfolded hidden agenda of their masters in New Delhi and made the militant commanders and cadre the first targets”, he said and urged people to come forward and seal their disapproval against political bigots and hypocrites. He said PDP had pushed Kashmir to the wall and it is now up to the people to reclaim their dignity and respect.Dr Abdullah recalled the apprehensions he had expressed publicly during 2014 Parliamentary and Assembly elections about dubious characteristics of the PDP, notwithstanding its pretentious anti-BJP campaign, and said time had proved him right and vindicated his stand. He asked as to what had happened to the promises of repealing AFSPA, return of hydel projects, jobs to youth and Kashmiri Pandits return.“I am cautioning you again this time against treacherous role of the PDP, which is employing all dirty tricks to fool the people again”, he said and exuded confidence that all their ploys will fall flat before the strong will of the people. 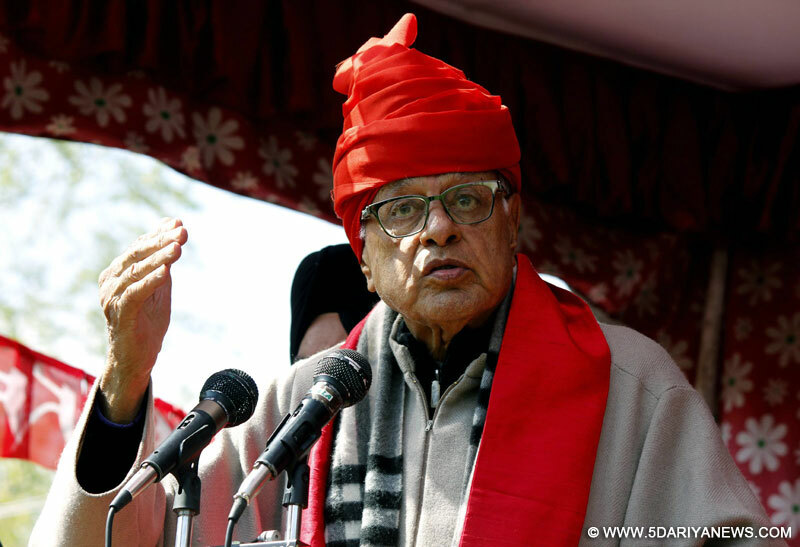 He exhorted the voters to remain steadfast in their resolve to punish PDP through their power of vote.Mocking PDP’s much abused slogan of “Goli Se Nahi Boli Se”, Dr Farooq Abdullah said that they made innocent youth fodder of their cannons. “PDP is aligned to such forces, which are persecuting Muslims across the country by tainting them as anti-nationals. He said an onerous responsibility has now been cast upon the people to choose between forces inimical to Kashmir and those who have all along offered sacrifices for their honour and dignity. Addressing the gathering senior Congress leader Mr Tariq Hamid Karra said that he begged late Mufti Mohammed Sayeed for almost a year not to align with the BJP but he didn’t relent. He said his pleas of BJP perpetrating mayhem with Muslims in Gujarat were ignored for sharing the loaves of power.Karra said that Mufti Mohammed Sayeed facilitated the entry of BJP into Kashmir and the RSS cadre are feeling elated over their success in making the Valley target of their venom.The former MP cautioned against the threat of continued presence of the BJP in the government and said the people will have to give a decisive mandate to Dr Farooq Abdullah from Srinagar Parliamentary Constituency and Mr Ghulam Ahmed Mir from Anantnag so that a strong message of resistance is sent to the RSS.Senior National Conference leader and MLA Kangan Mian Altaf Ahmed recounted the oppression unleashed by the PDP-BJP coalition government over the people during 2016 unrest. He exposed the PDP saying they exploited the people and got votes in the name of Pakistan, Islam, Mujahids and Jamaat-e-Islami. He said the PDP sold dreams about solving the Kashmir issue.